This feature article presents Tom Garner’s Diary of his activities during WW1 on the Eastern Front between November 1915 and March 1919. During WW1 the Eastern Front was a theatre of operations that encompassed, at its greatest extent, the entire frontier between the Russian Empire and Romania on one side and the Austro-Hungarian Empire, Bulgaria, Turkey and Germany on the other. It stretched from the Baltic Sea in the north to the Black Sea in the south, included most of Eastern Europe and stretched deep into Central Europe. The Eastern Front contrasts with the Western Front, which was being fought in Belgium and France. Thomas Heyfield Garner (Tom) was born in Olney in 1896, the only son of Joseph James Garner (the ‘draper extraordinaire’ who founded ‘Garners of Olney’ in 1886 – see the extensive feature article on this website). Tom attended Olney Council School (1906) and Bedford School (1909) and was employed by Bates of Bedford from March 1912 and with Garners of Olney from March 1914 before entering Military Service in April 1915. 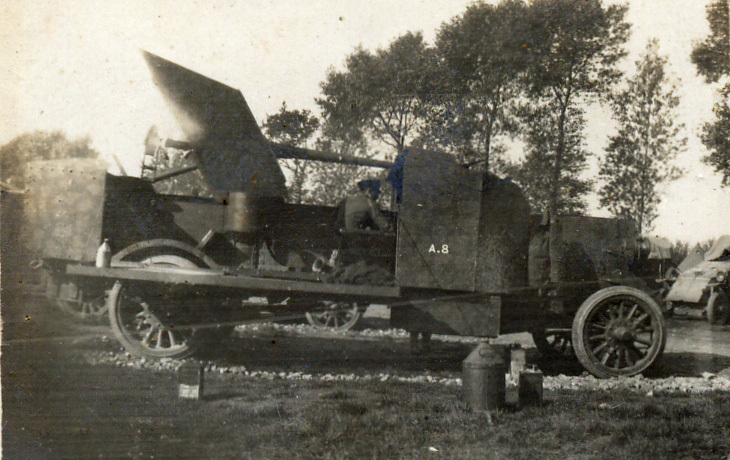 Tom was with the Royal Naval Air Service (RNAS) Armoured Cars between 15 April 1915 and 12 November 1917 (Service No. 4027). Tom’s first period of Military Service was in France and Belgium on the Western Front, Tom left Olney for Belgium on 4 July 1915. No diary entries from Tom have come to light during this period of his War Service. Tom was later assigned to the Armoured Car Expeditionary Force (ACEF) supporting the Russians against the Turks. This period of War Service started on 26 November 1915 and ended on 12 November 1917 and is extensively recorded in his diary and presented in this article. Tom was transferred to the Machine Gun Corps and served with them between 31 January 1918 and 14 March 1919 (Service No. 79788). This period of his War Service is also extensively recorded in his diary and presented in this article. Tom vividly describes in his diary entries the bizarre conditions to which servicemen were subjected, as viewed through the eyes of a twenty year old young man. Not least, it provides rare detail of the harsh environments, i.e. battlefield, living conditions and natural, to which servicemen were subjected on the Eastern Front. On his return from Military Service, Tom resumed his position at Garners of Olney and became a Partner in February 1924 (i.e. J Garner & Son). Tom married Hilda Frances Cowley in 1924 and they had two sons, Brian and Stephen. Hilda died aged 32 years in 1932. Tom took over and successfully ran the family business after his father’s death in 1944. Tom died aged 66 years in December 1962. 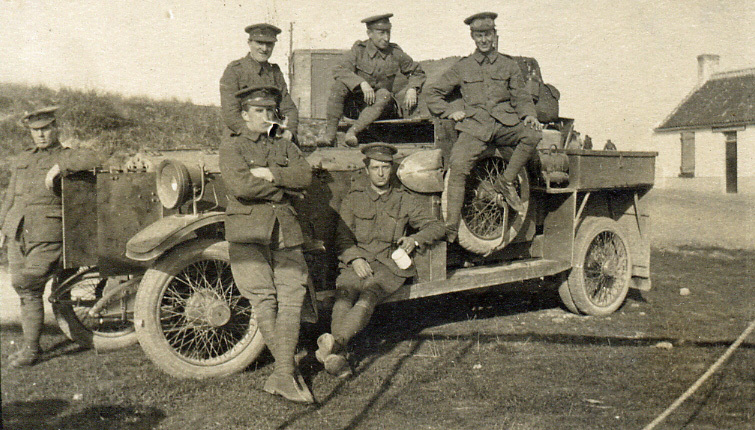 Editor’s Note: As the above photograph demonstrates, Tom was attached to a squadron of the Armoured Car Division whilst it was on operational duties in France and Belgium. During World War 1 the Royal Naval Air Service operated Armoured Cars which were transported by ship and train to battlefields on the Eastern and Western Fronts. Oliver Locker-Lampson personally funded the establishment of an armoured car squadron for the Royal Naval Air Service and in December 1915, he received a commission in the Royal Navy Volunteer Reserve with the rank of Lieutenant Commander. By the end of March 1915, 36 Lanchester armoured cars equipped three squadrons of the Royal Naval Air Service (RNAS), Armoured Car Division. All these squadrons were in France by May and operated in the unoccupied portion of Belgium. At the end of 1915 two squadrons, which were inactive because of the trench warfare situation, went to Russia with Commander Locker-Lampson. In January 1916 three RNAS squadrons, each of 12 Lanchester armoured cars, were sent by ship to Murmansk as the Armoured Car Expeditionary Force (ACEF) with Locker-Lampson. They operated with the Russian Army in several areas including Galicea, Romania and the Caucasus. The RNAS later deployed to the Black Sea thence to Romania and Galicia to support the Russian forces there. After the Bolshevik Revolution of October 1917 the ACEF was withdrawn from Russia. The RNAS maintained its rear supply base at Kursk until January 1918 when the force withdrew by rail towards Murmansk. The troops and their vehicles departed Murmansk by ship on 1st February 1918. In 1918 selected personnel and armoured cars transferred to the Machine Gun Corps and served in Persia and Turkey. 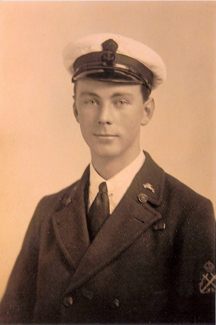 More information on Oliver Locker-Lampson can be found in Reference 1 and on the Royal Naval Air Service in Reference 2. 1. Oliver Locker-Lampson and the Russian Revolution, author Adrian Deakes, published 10 November 2014. 2. Voices in Flight: The Royal Naval Air Service during the Great War, author Malcolm Smith, published 2014. Tom himself transcribed his diary entries in his own handwriting into a notebook presumably sometime after leaving the Armed Services. The full transcribed diary extends over 134 notebook pages. Tom simply titled the diary ‘Adventures in Russia’. Roger Gooden, a nephew of Tom Garner, has kindly scanned and transmitted a copy of the complete (notebook) diary to us (ODHS) for presentation on this website. Naturally, the diary is presented totally unedited. Roger has also provided us with copies of Tom’s fascinating and very illuminating photographs of the troops with their armoured cars. The photographs are displayed in the relevant web page installments. 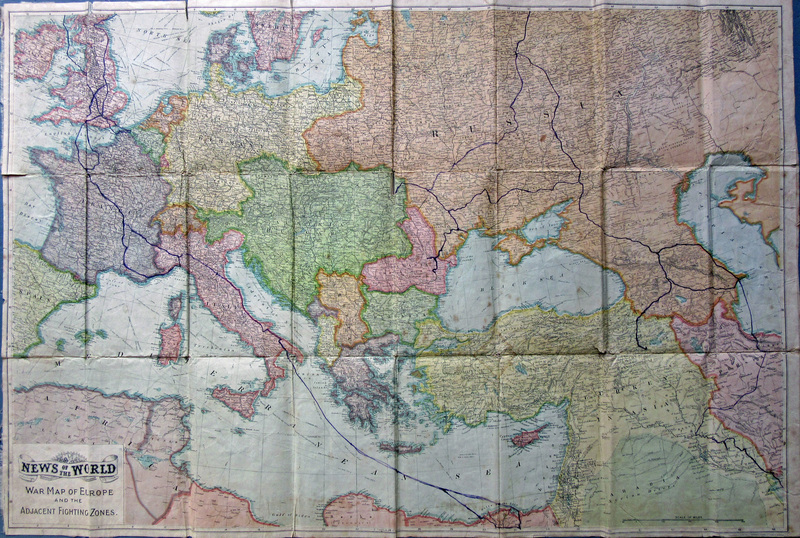 Roger also posted to us Tom’s original two maps of the war zones, one entitled ‘ News of the World – War Map of Europe and the adjacent Fighting Zones’, the other ‘Russia in Europe’. Both maps contain Tom’s personal markings of the routes that he and the cars took and have proved invaluable in illustrating Tom’s journeys over his ‘diary’ years. The maps are displayed in full and in sections throughout this feature article to illustrate particular aspects of Tom’s travels. 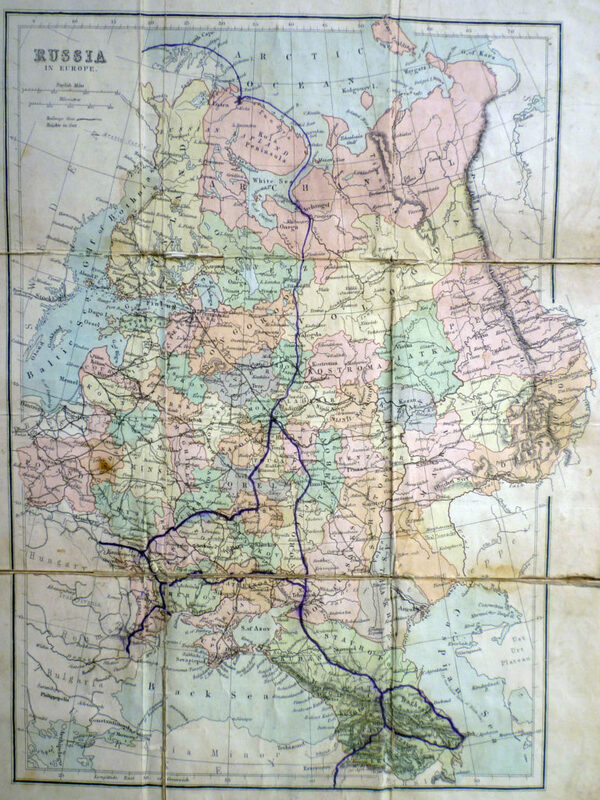 The complete (full) maps are available at the foot of this web page, but due to their limited resolution are intended to indicate only the major cities covered by Tom’s travels. The ODHS is indeed indebted to Roger Gooden for this material and other related information that has enabled us to develop this feature article. Thanks are due to Susan Neale for transcribing Tom Garner’s handwritten diary and also to Colin Kempson and Bill Eyres for their assistance and preparation work for the maps. Please note, that for the convenience of readers, the diary has been divided into several instalments. Please click the maps for an enlarged view. These map, due to their limited clarity, are intended to indicate only the major cities covered by Tom’s travels. Further detailed maps are available on the relevant pages covering that battle-zone, etc.